Bluewater Scuba: Where Nashville Learns To Dive - Bluewater Scuba - "Where Nashville Learns To Dive"
1. Click here to go to our calendar to sign up for class. 2. Stop by the shop and pick up your learning materials and any gear you need for class (students must provide their own Fins, Mask, & Snorkel (and booties if necessary). Save $25 if your sign up for any class in February, 2014. Call for details. 3. Complete the home study before your Tuesday night orientation. 4. Now you are ready to complete your pool sessions. You choose: Saturday OR Sunday. It's that easy. Call 615-308-0209 for information on upcoming classes. Does not include Airfare to Nassau. Does not include Airfare to Nassua. BLUEWATER SCUBA in partnership with GE Capital is happy to offer 6 mos., no interest financing for all your purchases with a GE Capital Bluewater Scuba Credit Card! Stop by the shop and get further details. The application and approval process only take a few minutes. Diving offers a lifetime of adventure and the most enjoyable and safest way to begin that adventure is to take our Open Water Diver course. Our goal is to offer the greatest value and the most comprehensive training available to create the safest and most comfortable divers. • Your choice of one full day in our pool: Saturday or Sunday. You choose. MORE POOL TIME! 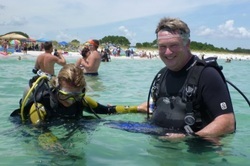 Training with Bluewater Scuba means first class instruction and first class convenience. No other program can offer what we offer. Sign up for Class ONLINE.